Fichtel & Sachs, suppliers of the trusty Kabinenroller motor for years, had drawings lying on the shelf for a 400cc two-stroke, two cylinder stationary engine. This was increased in displacement to 494cc and fitted with a four speed and reverse gearbox. It was mounted in a very advanced Formula One-style subframe incorporating a fully adjustable rear suspension. Wheels and front suspension arms were increased in size, as were headlamps and brakes, which were now modern hydraulics. The large, plush pilot's seat was needed to handle the phenomenal cornering power of this amazing vehicle. In September 1957, Fritz Fend presented his crowning achievement, the F. M. R. "Tiger" sports vehicle, to sensational acclaim in Germany. Its British debut is still the stuff of legend. Developed as a proper sports car but with an underdeveloped motor, it found a place with enthusiasts but not the general public. The "Tiger" name was owned by Krupp, so it was changed, supposedly to "Tourenfahrzeug-Gelandesport", or touring vehicle-cross-country sports, but the contraction fooled no one. 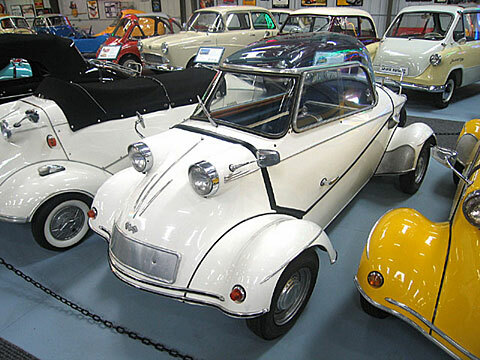 Now highly prized by collectors, it is the most valuable of all microcars. Weight: 305 kg Electrics: 12 v 4 Wheels: 4.40 x 10"